Jukka Viljanen is a long distances runner. He has participated to polar races both in North and South Poles. 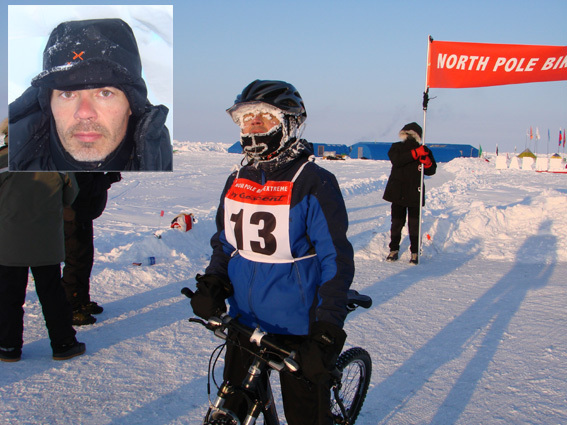 Jukka Viljanen has participated to the North Pole Marathon and the North Pole Bike Extreme (both 42,195 km) in the year 2007. Organised by Polar Running Adventures, this. This event takes place nearby Barneo North Pole Camp on a drifting ice between 89° and 90° North. The participants run a circular route of at 4,2 km which has to be repeated 10 times. Jukka arrived 6th in 4h 34'. The mountain bike race was an historical event because it has been held for the first time (and most likely the last one) at theNorth Pole. They were 13 bikers of which 6 had participated the running event. Jukka :"The temperature was around -30C. We were pedalling on specially designed mountain bikes on a special one mile course carved into the ice. It was one of the hardest races I've ever been. My final position was 4th. ..."
The next race Jukka Viljanen has participated to took place at 80 degrees South at the touristic base of Patriot Hills. It's certainly the coldest 100 km in the world. They were three 100 km runners and 16 marathon runners. It took him 14 hours to complete the 100 km course, arriving 2nd. For Jukka, it was "the" adventure of his life. Not only he had to participate to a quite difficult challenge but also, he had the opportunity to meet people from all over the world and make friends with alpinists, skiers, long distances runners, polar adventurers, etc. In addition, they had a stormy weather conditions that time and they got stucked in ANI Base Camp. Enough time to spend Christmas eve with 70 other adventurers and to attend a spectacular Christmas dinner. Here are Jukka Viljanen's other adventures: 195 km non-stop ultra marathon in Libyan Sahara and a couple of 100 km races in Finland. He works as a entrepreneur (Sportman Ltd) doing mainly corporate & motivational speakings and works also closely with a finnish running magazine "Juoksija" (The Runner). In 2009, Jukka Viljanen is 46 years old. Her has a degree in business and he used to work for media and advertising industry. Five years ago, he decided to follow new trails; to use his marketing skills to promote his own running adventures through mass media, so he has been able to support himself and raise money for his next adventures. Latest : during August and September 2010, Jukka together with two friends of his (Kirsi Montonen and Greg Maud) managed to run 1000 km across the Kalahari Desert, some of Botswana's most remote wilderness. See the story of this adventure here.